Coordinated protests in Clare and Dublin have been announced for Donald Trump’s arrival in Ireland later this month. 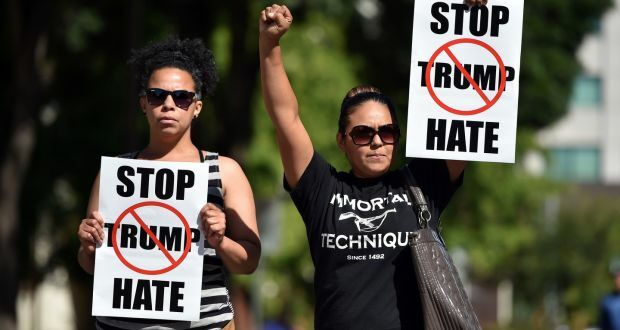 Organisers of the “Trump Not Welcome” group, formed on Tuesday, say they hope the demonstrations, if not seen by the presumptive Republican presidential nominee himself, will attract US media attention. Mr Trump, who continues to exasperate with his comments in the run up to November’s election, is due to arrive at Shannon Airport on June 23rd and visit his Doonbeg golf resort in Co Clare before leaving on June 25th. His itinerary, however, has not been confirmed. The “Trump Not Welcome” group is a coalition of political and interest groups including the Anti Austerity Alliance, People Before Profit, Green Party, United Against Racism and the Irish Anti War Movement.